Are you and your lovely wife going to be celebrating your 30th Wedding Anniversary this year? If you are, have you thought about the kind of 30th Wedding Anniversary Gift to give her? If you haven’t, then maybe we can help you make the right decision. A 30th Wedding Anniversary is a very important event in any married couple’s lives. It shows what a strong bond you have and have been able to cope with all the stresses and strains that life places upon us. When it comes to finding the best gift to present to your wife on such an important day, you might go down the traditional routine, but also select something for your wife that’s unique. The 30th Wedding Anniversary gift for your wife will help to show just how much you love her and how much she means to you. When it comes to choosing the best wedding anniversary gift for such an important date, you have learned that they classify certain years by certain materials. For your 30th Wedding Anniversary, the material that best symbolises such an important date is “Pearls”. You don’t have to stick to pearls you can mix it up if you like. This has become the material closely linked to couples that got married 30 years ago. The reasons for this being that not only are pearls enduring, but they also have the ability to last under pressure, as your marriage has. You don’t have to go down the route of choosing to buy your wife a pearl necklace or pearl earrings, you can also take a look at other options. You could go down the route of buying her a 30th Wedding Anniversary present that includes diamonds in the design. They say diamonds are the symbol of an enduring flame that will help to fuel your marriage for years to come. But if you can afford to it is worth considering investing in something that includes pearls in the design. Also, you can think about investing in a piece of jewelry that comprises not only pearls but also diamonds. To help you we list below a few ideas of beautiful 30th Wedding Anniversary gift ideas you can present to your wife on this very important day in your lives. What woman wouldn’t love being presented with a beautiful bouquet on her wedding anniversary? Presenting her with a stunning bouquet of lilies will bring a smile to her face and they are also the official flower of your pearl wedding anniversary. You could arrange a big bouquet of these flowers be sent to her first thing in the morning on the day to help get it off to a good start. A simple gift that is full of sentiment and you can choose a photo album cover or a frame that’s embellished with faux pearls, along with vibrant silver or gold metal. You may even want to consider having a special message embossed onto the cover or etched onto the frame. Even these days’ women still love to be the recipient of a piece of jewelry that includes diamonds into the design. This would make the perfect gift on your 30th Wedding Anniversary day. There are some amazing pearl and diamond necklace designs to choose from and come in at different prices. You could if you have the money available have one designed for your wife, and this may well prove to be the best 30th Wedding Anniversary gift ever. Does your wife like to change her style often? If she has her ears pierced does she like to wear diamond earrings one day, then the next a simple pair of pearl stud earrings? Then you may find that beautiful pair of pearl drop earrings make the perfect gift to present her when the day of your 30th Wedding Anniversary arrives. You don’t have to stick to the usual pair that comprises white or cream coloured pearls. Instead, be a little more adventurous and choose a pair of earrings that include lavender, pink, gold or black pearls in their design. If you want to make them even more special choose a design that also includes diamonds in the design. If your wife is someone who isn’t into wearing more conventional pieces of jewelry like strings of pearls, then there are plenty of other styles of pearl necklace to choose from. Women who like to keep things simple when it comes to jewelry will love the beauty yet simplicity of wearing a stunning pearl pendant necklace. You will find you have a varied selection of different styles, shapes, sizes, and colour pearl pendants to choose from. Some of these will feature yellow or white gold or silver others may include diamonds in their designs. There isn’t anything simple about pearl rings these days. You will find like any other piece of 30th Wedding Anniversary pearl jewelry, pearl rings come in a wide variety of different styles and designs. You might buy her a beautiful pearl ring that comprises a single white pearl that has been mounted on to an 18k white gold setting. Again you may also want to consider investing in a ring that also includes diamonds into the design. For an even more romantic touch, why not think about using this 30th Wedding Anniversary gift to propose to your wife once again? We know that this will thrill her. If you can afford to why not invest in a beautiful, cultured pearl jewelry set that comprises a pearl necklace, bracelet, and earrings? You could even consider sets that are composed of just a pearl pendant and pearl earrings. The great thing about buying such a 30th Wedding Anniversary gift for your wife is that she can wear them however she likes. She may want to just wear the necklace or pendant on its own or teamed with just the bracelet or earrings. You have the opportunity to choose from a wonderful array of different styles of pearl jewelry sets. These will come in an array of different colours, shapes, sizes, and styles. 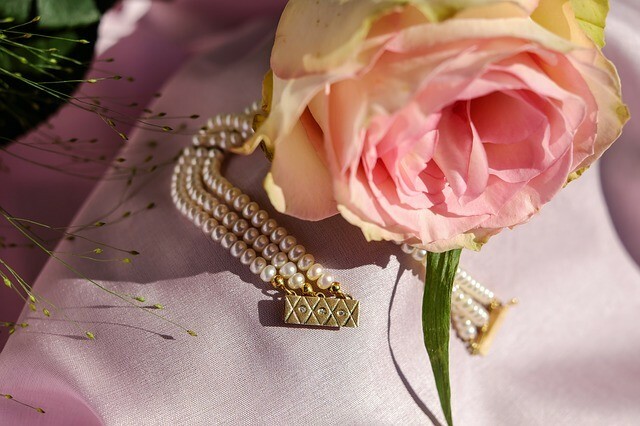 When thinking about buying your wife some pearls to present to her on your 30th Wedding Anniversary, you might invest in jewelry made from Hanadama pearls? These are the perfect 30th Wedding Anniversary pearl jewelry choice. Not only are they considered being of the highest quality, but have a special luster to them. Such a gift will not only make your wife feel adored but also very appreciated. Whatever kind of pearl jewelry you buy for your wife it is important to make sure that the piece you choose is of the best quality possible. Choose a piece or pieces of pearl jewelry that have a high luster to them. At this stage of your marriage you should already know what your wife prefers and the kind of style she likes to follow. Yet when presenting her with a gift on your 30th Wedding Anniversary, you need to give her something that says not only how much you love her now but also helps to signify the time you’ve been together. That is why we suggest that you go down the route of buying your wife a gift that includes pearls in the design. Plus, you can choose something that also includes diamonds in the design. Hopefully, on the morning of your 30th Wedding Anniversary, when you present her with the gift you’ve chosen she will love what you present to her. No woman has ever got upset when presented with a beautiful piece of jewelry. If you are unsure about what to get her you could always ask a close family member or one of her friends to help you select the perfect piece of 30th Wedding Anniversary pearl jewelry. Here at PearlsOnly.com, we have a wide selection of different pieces of beautiful pearl jewelry to select from. So finding a piece that won’t only suit your budget but also your wife’s tastes shouldn’t prove at all challenging. So now is the time to look at what is available so you can choose the right piece or pieces of 30th Wedding Anniversary pearl jewelry for your wife before the big day arrives.